■ Laparoscopic hysterectomy is the most common surgery associated with lower urinary tract injury. ■ Cystotomy is the most common urinary tract injury. Small injuries to the dome of the bladder can often be managed with prolonged bladder drainage. When surgical repair is required, this can often be accomplished with laparoscopic suture techniques. If injury occurs at the time of hysterectomy, transvaginal repair is also an option. 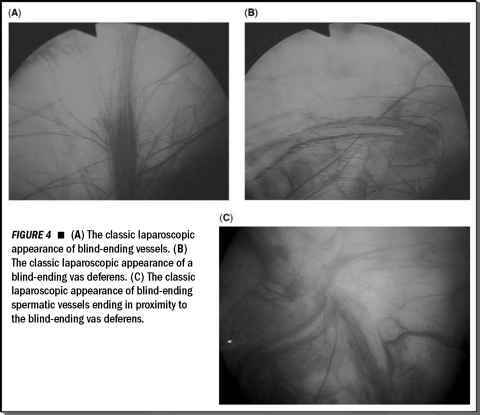 ■ If there is concern regarding a possible ureteric injury but none can be visualized laparoscopically, ureteral patency should be confirmed. Otherwise, a ureteral stent should be placed. An obstructed pelvic ureter should be repaired. ■ If there is any question regarding renal function or another upper urinary tract injury, an intraoperative urogram should be performed to confirm bilateral renal function. ■ When the ureter has been obviously transected, laparoscopic ureteroureterostomy or reimplantation is an option. ■ Injury to the urethra is unusual during laparoscopic gynecologic surgery. However, injury can occur during suburethral sling procedures, often done in conjunction with laparoscopic hysterectomies and surgeries for pelvic organ prolapse. Typically these injuries are managed either with prolonged catheter drainage or with surgical reanastomosis. ■ If ovarian cyst rupture occurs during laparoscopy, it is often helpful to place the patient in the reverse Trendelenburg position to prevent the cyst contents from spreading throughout the pelvis. Using warm irrigation fluid, copiously irrigate the pelvic cavity to prevent the peritonitis that may result from the cyst contents.